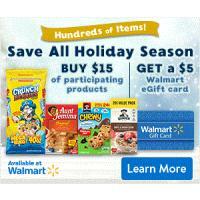 Tis the season to save BIG at Walmart! Now through December 15, get a $5 Walmart eGift card when you buy $15 of participating Quaker® products online or in store. Choose from over 400 Quaker® items, including your favorites like Quaker® Oatmeal, Aunt Jemima®, Cap’n Crunch®, and so many more. I just love life cereal.